It’s Monday morning, you’re Googling your brand and you can’t find your website. At all. It’s been completely wiped off the face of Google. How could this happen? What have you done? WHO IS SHE?! Let’s skip a few panicked steps and get to the point where you realize your site is de-indexed or penalized by Google. How did this happen? Uh oh. You did a bad. Learn more about manual actions right from the horse’s mouth. This one isn’t usually about de-indexation but rather a penalty and loss in organic traffic. Every so often, Google announces an update to their mysterious algorithm. Each update comes with a theme. For example, the 2011 Panda update was all about content, so if your site became penalized in this update it was because you had low quality or duplicate content/pages. Another significant algorithm update was Penguin in 2012 which looked primarily at backlinks. If you had a questionable backlink profile, you may have seen your organic traffic dip significantly.You can learn more about algo penalties here. Algorithmic penalties are the scariest – they can be difficult to recover from and while there are themes to each update, there’s no guarantee that updating issues on your website is going to bring back your glorious organic traffic. That said, it’s not impossible to recover! Adster has helped clients ethically move domains and slowly rebuild their organic rankings. It’s a long con but in the end, absolutely worth it. 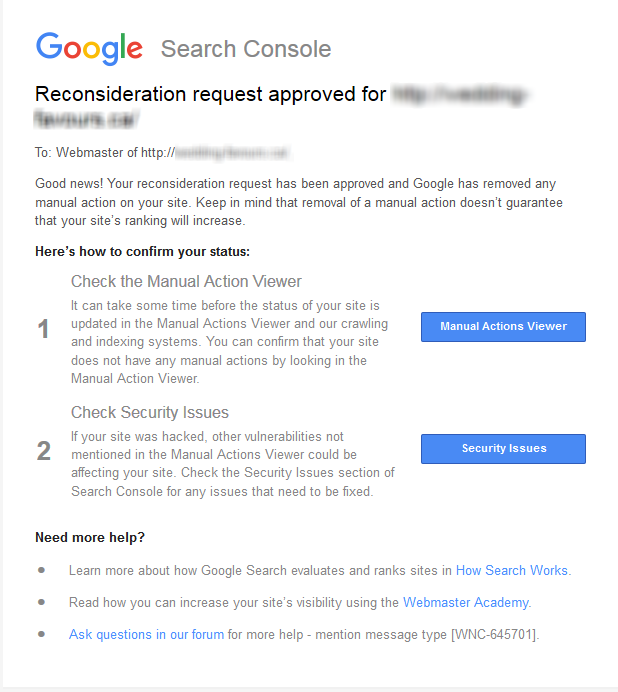 Moz also has a great case study on recovering from an algorithmic penalty. WHY WHY WHY have manual and algorithmic penalties? It’s to weed out all of the garbage on the internet – there’s a lot. But sometimes it will affect legitimate sites like yours and it’s a sign to shape up your website. Your site doesn’t have duplicate content. You don’t even know what keyword stuffing is. You’ve been working with a primo de la primo SEO agency like Adster and they only use the best SEO practices! So… what happened to your site! It’s entirely possible that there is a technical reason behind why your site has disappeared from the search results – we’ve seen it happen! If your robots.txt file reads Disallow: /, then Google may not be able to crawl your site and so it may not be indexed. It’s common to block the Googlebot from pages like your CMS login (wp-admin) but you don’t want to block it from getting to your home page and all of your great pages! Just edit your robots.txt file. Phew! In the Admin settings of WordPress sites, there may be a privacy setting that is purposely “discouraging search engines from indexing the site”. Find this and uncheck that box, girlfriend! It is not doing you any favours. This is a very specific case but: a plugin in your WordPress site updates automatically, updating the htaccess file, blocking Google from getting at your pages by causing 403 errors across the site. Specific, but it happened to one of our clients! This client has recovered nicely, with new organic users up 75% since The Incident in March. There are many zany ways your CMS can accidentally do something like this. Best advice is to become BFFs with Google Search Console and understand when something is fishy – look for 403 errors, a huge drop in indexed pages, fetch & render errors, and the like. Has one of these things happened to you and you aren’t sure how to handle it? Contact Adster Creative today, we’ll help you navigate these tricky waters with ease.